I'm not sure why, but I rarely use a grid design on my layouts, but always love how clean and neat they turn out. For this layout, I used my Studio Calico February Kits. First, I chose this photo of my son Cole from 2011. He is always smiling and happy since he was a baby. Next, I cut a piece of black & white striped patterned paper down to 6x12 and used this as the base for the grid design. I went through the cards in the Project Life Kit and found these 3 that i wanted in my layout. One card for journaling, one for a sub-title/quote, and one with a heart that I could embellish even more. I layered a few pieces of plain white card stock behind my photo to help it stand out from the patterned papers. I found the Crate Paper "Poolside" woodgrain paper in my stash and adhered it behind the layered photo. 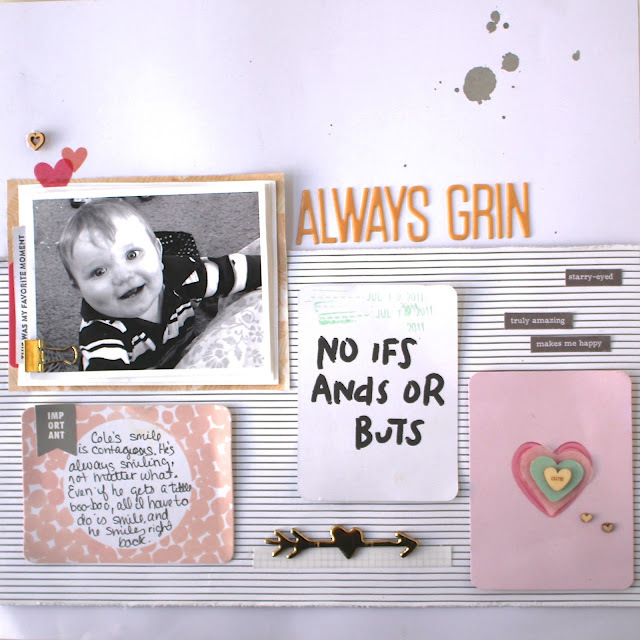 I then added my title using the gorgeous peach puffy alphas from the Scrapbook Kit. I wanted to layer up the heart Project Life card to make it pop. I used a wood veneer conversation heart from the kit and glued it to a blue heart that I punched from my scraps. Behind that, i hand cut a couple more hearts out of a glassine bag and adhered it with pop dots. The gold chipboard heart arrow is from the Crate Paper "Hello Love" chipboard sticker sheet. I stuck that to a piece of scrap paper before gluing it down. I added my journaling to the project life card and added a charcoal banner sticker from the Planner Kit. I added the date to the quote card with a Studio Calico Roller Date Stamp using my favorite Studio Calico Color Theory "Mint Hint" ink pad. I then used the Hello Forever Stamp Set in the Kit on a piece of white card stock and cut it out and stuck it in the layers behind my photo. I also used a few vellum heart stickers above my photo to add a bit more color. I scattered and few tiny wood veneer hearts, added a couple word stickers, and splattered some gray ink to complete my layout. I hope you enjoyed this layout and would love to here about your techniques when it comes to grid designs. I think I'm going to try and use grids more often. They come together so easily and turn out so great. Have a great weekend!